The girl singers croon "On the boardwalk in Atlantic City." The glitz and decay vie for space. French director Louis Malle's vision captured in Atlantic City is stunning and perceptive. The theme of the old giving way for the new is executed to perfection. Yet, there's affection and respect for the past. One of the truly great elements of Atlantic City is that it has a unique voice. I don't recall ever seeing anything quite like Atlantic City, except perhaps a film played for broad satire, which is not the case here. There's a lot of very sharp, biting humor in Atlantic City, but it is derived from the characters and their situations. There are no snappy one-liners, but the humor evolves organically. Grinding it out against the new boardwalk glitter is a gritty drug tale that introduces a set of splendidly realized characters. Lou Pasco is silver-haired small time hood hanging onto the past by Grace's fingernails. Grace, a former beauty queen and the wife of a diceased gangster, primps and complains in her bed with a small dog in her arms as Lou answers her insistent calls. Lou takes care of Grace. 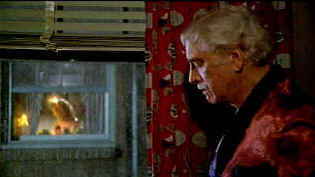 Across the courtyard from Lou, Sally's window beckons lasciviously. Sally splits open clams at the Resorts Casino and is studying to be a dealer. When Sally's little sister shows up Atlantic City lights up for these character like a fourth of July fireworks show. John Guare's very sophisticated Atlantic City gives director Malle great raw material to bring to life. It brilliantly sets up the chief elements of the plot with little waste. There are such a complex mix of characters, yet they all have their own voice. It's a tribute to the script and the brilliant direction of Louis Malle. Every element of the film is set up in the first three or four minutes without seeming forced. Think of the little throw away line from Sally as she exclaims "No fish." It's wonderful. Burt Lancaster is nothing short of magnificent in Atlantic City. What a fantastic late career performance opportunity. It's one of the actor's best roles and its his fifth decade of lighting up the silver screen. Lancaster's grace and elegance have a tinge of forced preening perfectly suiting Lou. Malle's casting is inspirational. Kate Reid, playing Grace, pairs perfectly with Lancaster. The byplay between the two is awesome. Grace may be a caricature but she is closer to reality than cartoon. It's her unique reality. The young Susan Sarandon is quite a striking Sally. Her natural sexiness lit by an interior fire with lots of character strength. The strong supporting cast includes French sophisticate Michel Piccoli as the casino man training dealers. He adds a layer of sophistication to the world of Atlantic City. Malle's instincts are unfailing in Atlantic City. He knows where to place the camera, when to come in close on characters, what details illuminate the script for greatest power and effect. The lemon bathing scene is an instant classic. Absolutely. It's sensual, and so sly in the way Malle depicts Lou watching with still breath from his darkened apartment. There's one sensitive, tender sensual scene between Lou and Sally. The scene is even poetic. It reminds me a bit of Bernstein's elegiac remembrance of the girl in the white dress in Citizen Kane. Lancaster and Sarandon make you believe in the moment. Malle finds a perfectly luxurious pacing for Atlantic City. The pacing is much like the lemon scene, like the movements of the lemons across Sally's flesh, graceful, sensuous, patient. Malle rolled a string of sevens with all his decisions for Atlantic City. Michel Legrand's score and Malle's choice of in situ music, like Bellini's Norma, is shimmering. The trio singing Atlantic City or Robert Goulet's crooning at the hospital, the music evokes the time and place and the past as well. Even Lou's choice of jazz fits the character like a custom tailored suit. And kudos to the location scout who selected the car elevators for a short, thrilling, technically masterful chase scene. Could it have be written that way in the script? Don't fail to visit Atlantic City through this glorious film! Atlantic City is no seedy DVD. It sprightly and sharp and alive. Some of the long lens work is extremely grainy, but it seldom evident. Very full color saturation adds excitement. Black levels are excellent. Black on black detail is perfect. The raw bar scenes at the Casino are breathtakingly beautiful. Sharp detailing, perfect color, bright with theatrical contrast. How about the detail on Joseph's overcoat: perfectly stable and intricately revealing. Check out the fruit basket in Sally's apartment. You might as well be picking it out at the super market. Colors are incredibly accurate. The yellows in the construction equipment are perfect. The flower shop is an explosion of color. Interior shots are simply lovely. Range of skin tones is outstanding and natural. Fine light output and contrast balance. Good depth in the detail. The Dolby Digital 2.0 mono sound is clean and open and captures the feeling of place.